If your child loves My Little Pony and needs a new winter hat then this Rainbow Dash Flipeez hat is perfect. The hat is light blue just like Rainbow dash and has it’s rainbow-colored manes and his big eyes on there too. And there are wings on the side of the hat that flap out by pressing the tassel that hangs on the side. 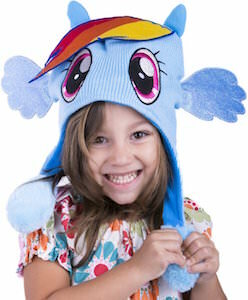 Kids are going to love wearing this hat and making Rainbow Dash wings move. So surprise your child with a winter hat they will wear because it is awesome, surprise them with this Rainbow Dash Flipeez hat.